Only last Sunday Father Peter began his homily saying that the readings did not offer up much for intricate study or for explanation from the preacher. This morning, as we return to the Letter of James, I feel that we are pretty much in the same situation… There are moments when convoluted discourses might actually detract from the simplicity of the Scriptures. 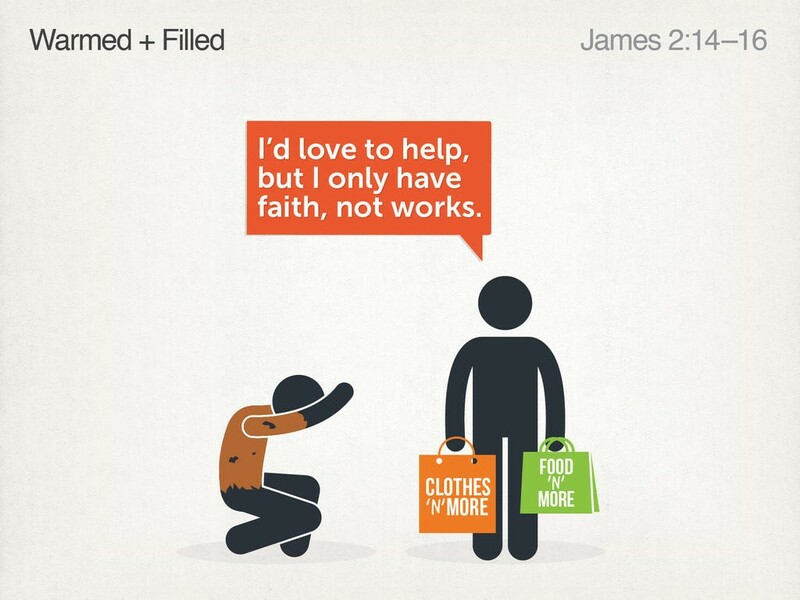 James says to us, “Faith without works is dead”. To which I could reply “Amen” and leave my sermon at that. But, as you may guess, I am not going to do that, if anything, because these few short verses of have been at the centre of very heated controversies through the centuries, and so it might be good for us to explore a little more about what the Apostle meant when he wrote them. ‘we are justified by faith, [and] we have peace with God through our Lord Jesus Christ’ (Rom 5:1). Yet, today we listen to James warning those who claim to have faith, but have never done a single good work, that faith alone cannot save them. As you can see there appears to be a tension between the two texts. This same tension between faith and works is often understood to be at the heart of the historic divisions caused by the Reformation. But all of this is largely a caricature of the truth. Although both Apostles speak about faith and deeds they had two different audiences and two different theological agendas to promote. Their teachings are not at odds, but rather, complementary to one another. We do not have time to enter into the details of Paul’s argument, but – reduced to its bare bones – in Romans Paul warns those who assume that abiding to the requirements of the ancient Law would save them that they are quite wrong. That is to say, we cannot please God just by doing good, but without believing; first and foremost we must put our trust in his Son Jesus Christ. Or, in very crass terms, if we do not have faith, we cannot buy our way into heaven. Conversely, James seems to say that as long as one is loving and generous, then he is saved by God, regardless of whether or not he has faith – Now, this would really be at odds with Paul and the rest of the Scriptures. But this is not what James is saying at all. Unlike Paul, he is not comparing those Christians who do little or no good deeds against unbelieving philanthropists who spend their lives in the care of others, or against generous people of other religions. This is not his aim. James is writing to people whom already identify themselves as Christians and should be saved by their affirmation of faith. James wants to contrast two types of people within our faith group; those who say they believe in God (even nominally, or on the census form) and then do nothing about it; and those who allow their belief to shape them into generous individuals abounding in good works. James affirms that the first group may say that they believe but their faith is dead because it does not produce any fruit. Whilst the second group readily demonstrate their living faith by the way they live and the things they do. In other words, it’s of no use to us to say the Creed together Sunday by Sunday, affirming that we believe in one God, creator of all things, and then do not care about his creation; it’s of no use to us to pray for the Church and then not to tend to its needs; and above all, it’s of no use to us to pray for those in need, ask God’s blessing on them, and then do nothing practical for them. One of the verses that follow on from this passage expresses this concept quite well. At v. 26 James says ‘just as the body without the spirit is dead, so faith without works is also dead’. Good deeds are what gives life to our faith, so by practicing justice and generosity we cultivate our faith and allow it to flourish.